This feature reports juice and concentrate use in Part IV – Summary of Materials Received and Used of the TTB Report of Wine Premises Operations in vintrace. This is to track juice/concentrate that is not intended to be fermented (i.e. it may sit in a tank or drum to be used for sweetening in production), and in other cases, it may be produced and perhaps sold to other wineries as concentrate. The Juice tax class is grape juice that is not intended to be fermented (ie, it will be added to wines directly or potentially sold later, eg, juice-and-go program)). 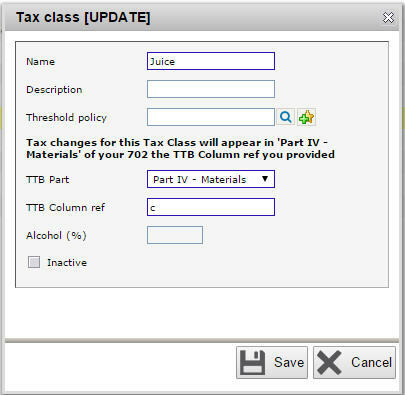 A tax class Juice is automatically created for you in Winery Setup > Policy > Tax Class. 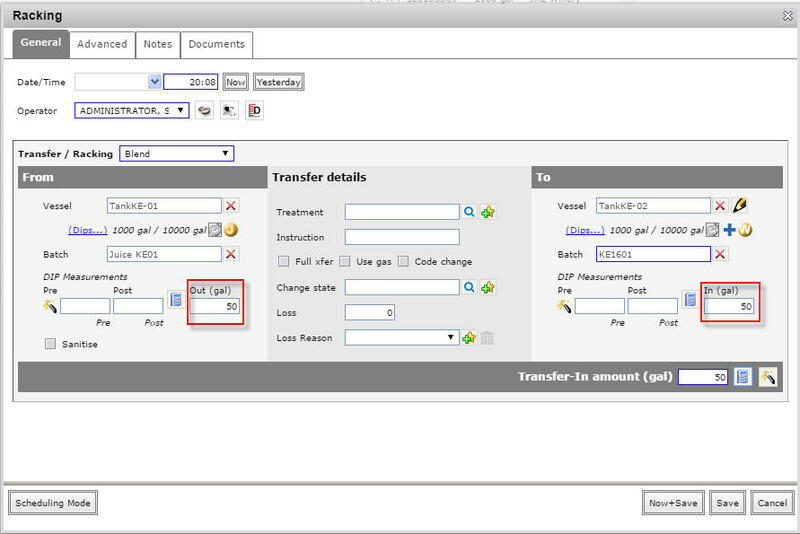 Any TTB event for this tax class will be reported in Part IV column (c) in the TTB report. Using a standard Bulk Wine Intake, bring the volume of juice you have received and put it into vessel (tank, barrel or keg). You will be able to give the juice all the usual grape origin information you require as with any bulk wine. The most important option is to ensure you give the juice product a Tax state of Bonded and select the Tax class Juice you have setup in the previous step. 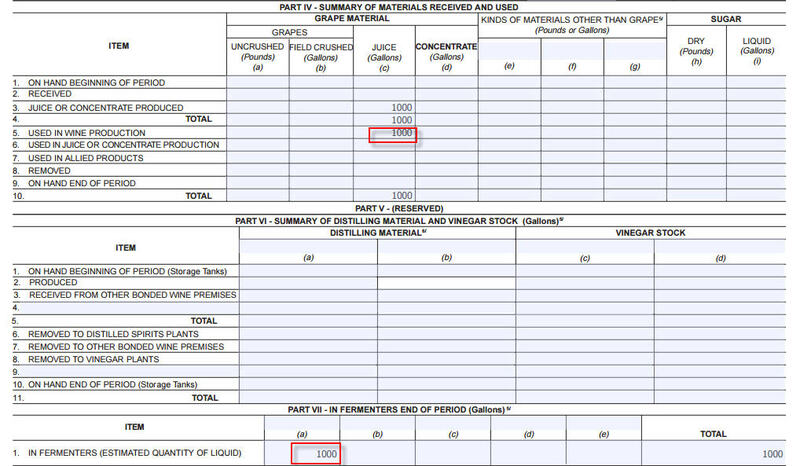 The bulk intake of juice we have done in the previous step is reported in Part IV row 2 Received, under column (c). To use any Juice to sweeten some of your wine, use any of the transfer operations in vintrace. NOTE: because the Juice is declared in a special tax class, any wine into which it is transferred must already have been declared. Once you complete the operation, the juice used will be reported in Part IV row 5 Used in wine production. And the wine involved in the blend operation will be reported in Part I in row 3 Produced by sweetening and in row 18 Used for sweetening. 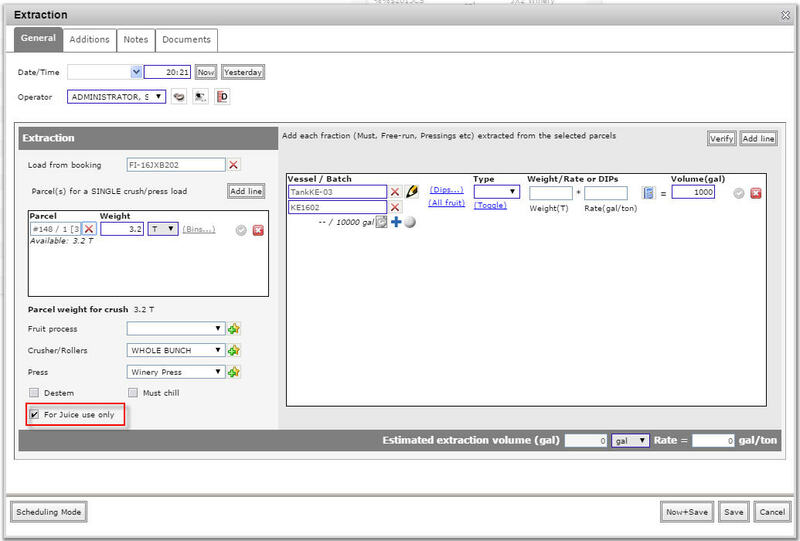 For an Extraction operation where the juice produced is not intended to be fermented, you have the option to specify that this is for Juice use only by ticking For Juice use only in the extraction operation screen. The juice produced will have a tax class of Juice. 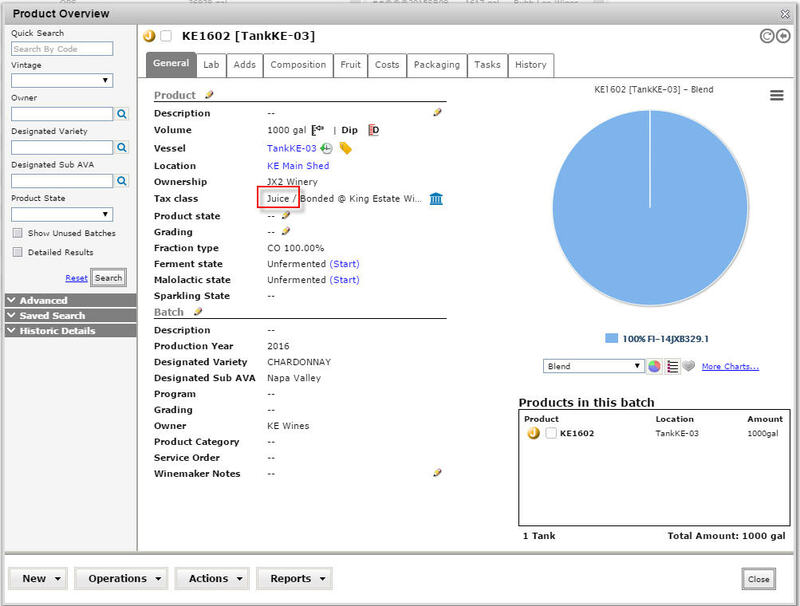 The volume produced in the extraction operation will be reported in Part IV row 3 Juice Produced in the TTB report. The following section will be for reporting concentrate in Part IV column reference (d) Concentrate in the TTB report. A new tax class Concentrate is automatically created for you in Winery Setup > Policy > Tax Class. 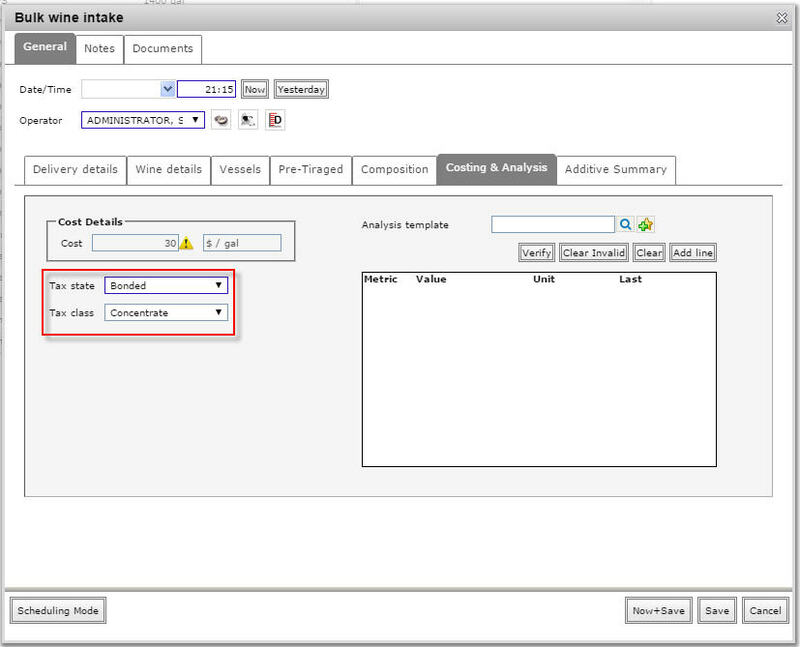 Using this tax class updates the values in TTB Part and TTB Column ref fields. Any TTB event for this tax class will get reported in Part IV column (d) in the TTB report. Using a standard Bulk Wine Intake bring the volume of concentrate you have received and put it in a vessel (tank, barrel, keg). You will be able to give the concentrate product all the grape origin information you require as with any bulk wine. The most important option is to ensure you give the concentrate product a Tax state of Bonded and select the Tax class Concentrate you have set up in the previous step. 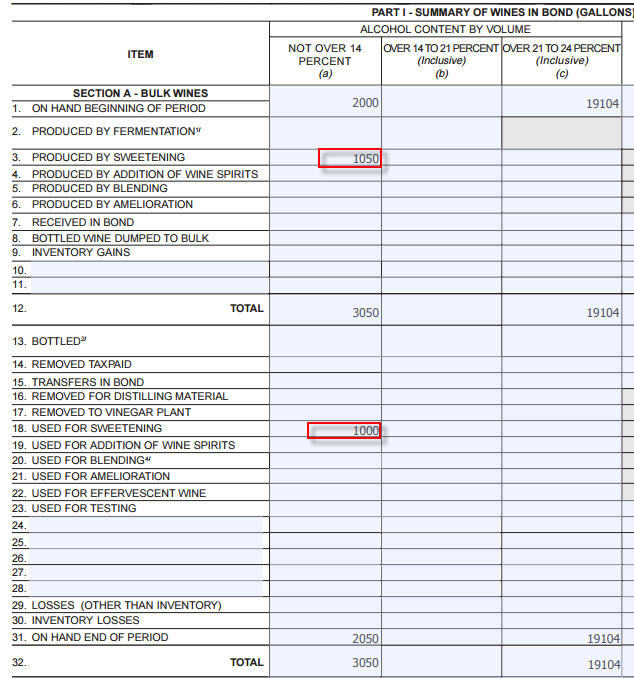 The bulk intake of concentrate we have done in the previous step is reported in Part IV row 2 Received, under column (d). 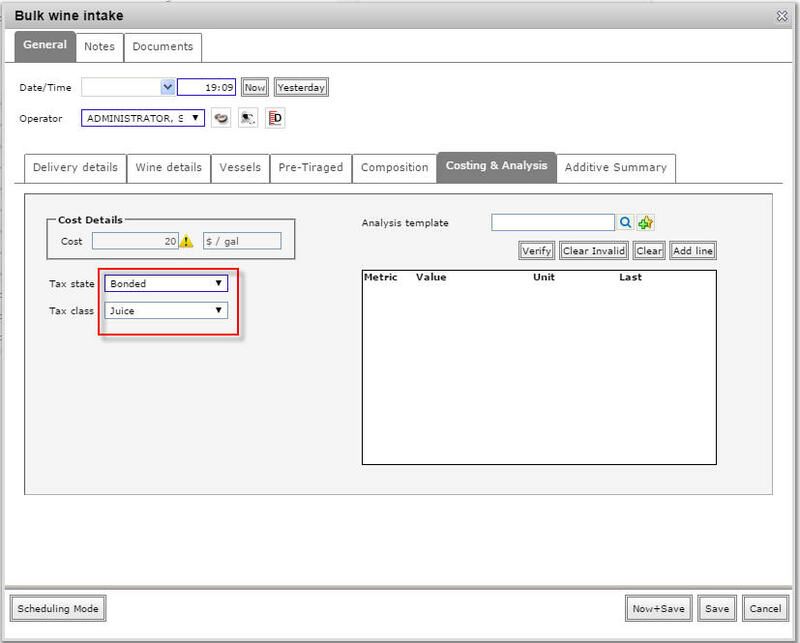 To use any Concentrate to sweeten wine, use any of the transfer operations in vintrace. NOTE: because the Concentrate is declared in a special tax class, any wine into which it is blended must already have been declared. Once you complete the operation, the concentrate used will be reported in Part IV row 5 Used in wine production, under column (d). If you have a juice product, concentrate product, or any product that has a tax class that belongs to d, e, f, or g in Part IV of the TTB report that you decide you want to use for wine production (ie, ferment it), you can undeclare them by applying a product treatment operation. Setup a product treatment to undeclare the juice. 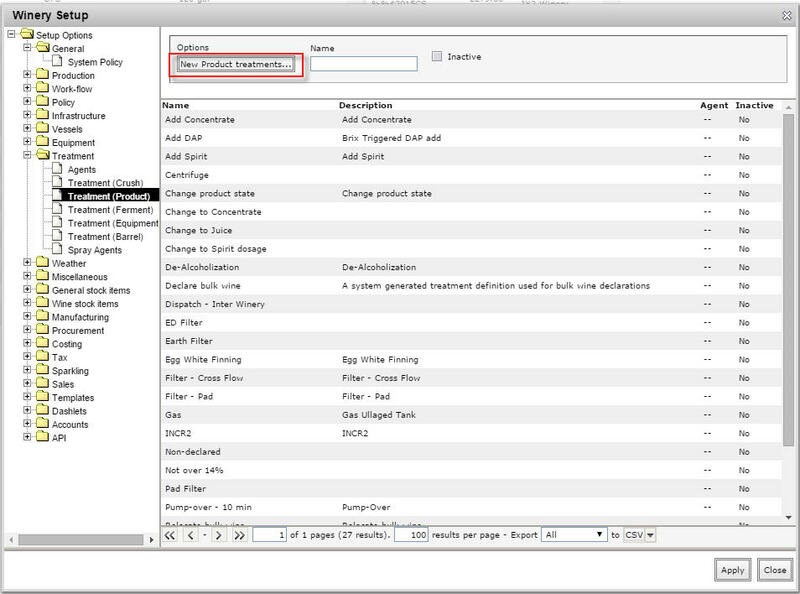 Head into Winery Setup > Treatment > Treatment (Product) and click on New Product treatments. 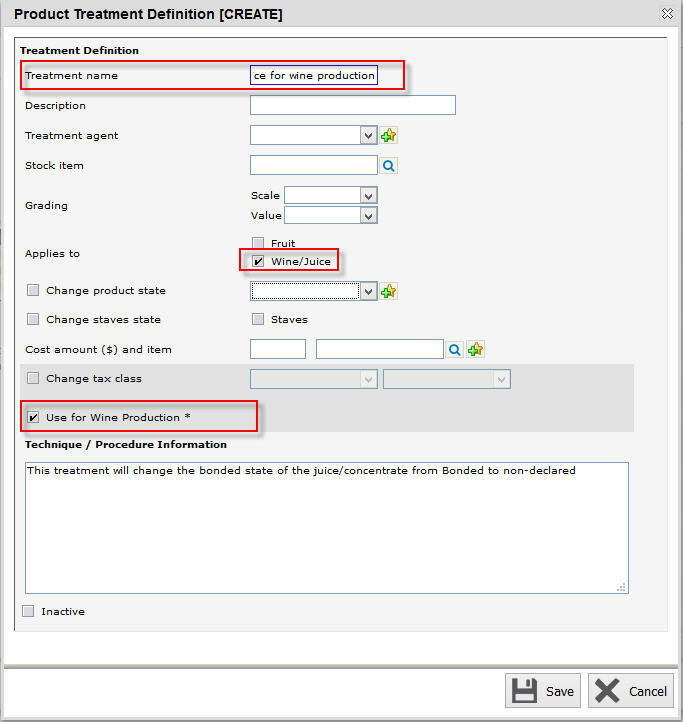 In Product Treatment Definition, provide a Treatment name, tick Wine/Juice checkbox in Applies to field, and tick on Use for Wine Production checkbox. Applying this product treatment will change the bonded state of the juice/concentrate from bonded to non-declared. 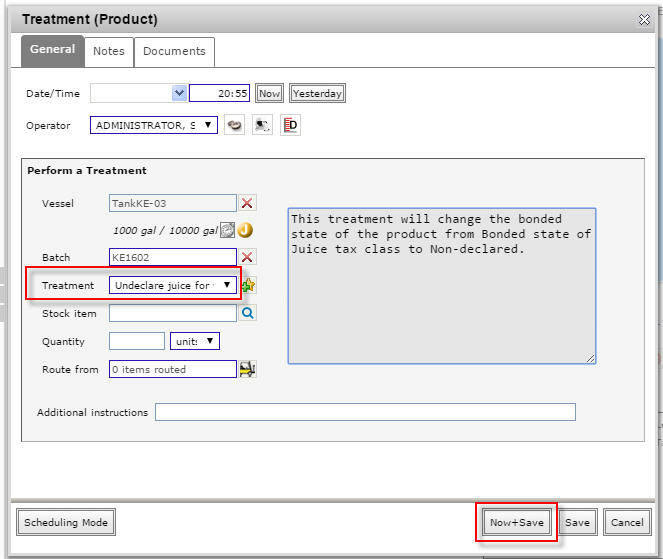 You can use this product treatment on a juice product by clicking on Operations – Treatment (Product) from Product Overview. 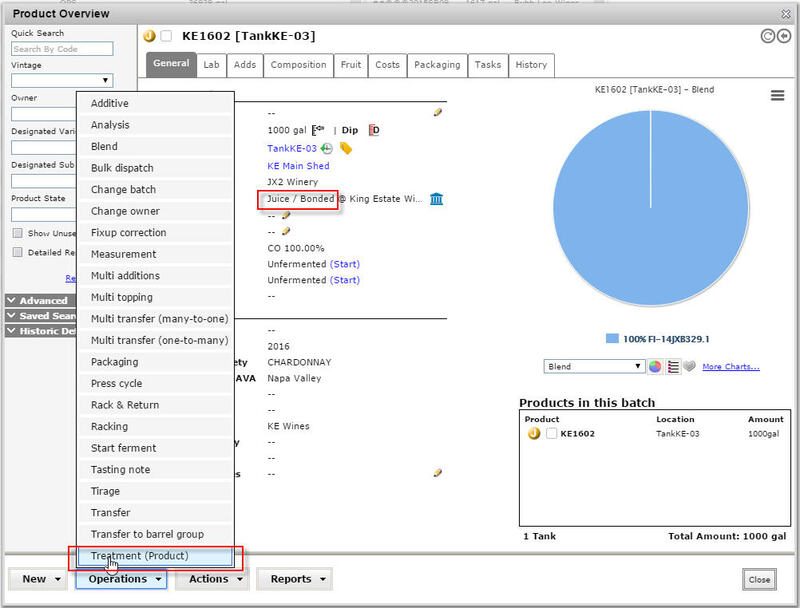 Select the product treatment you created to undeclare the juice in the Treatment (Product) screen and click Now+Save. 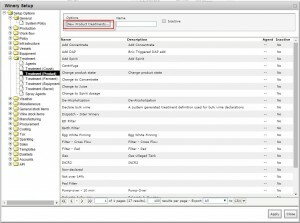 The product’s tax class is now changed to non-declared. In the TTB report, the volume will be reported in Part IV row 5 Used in wine production and under Part VII row 1 In fermenters.